Researchers at DESY have built a mini-particle accelerator that can perform four different functions at the press of a button. The experimental device called STEAM operates on terahertz radiation and can accelerate, compress, focus and analyze electron packets. Its active structure is only a few millimeters in size. Developers at the Center for Free-Electron Laser Science (CFEL) present their "Segmented Terahertz Electron Accelerator and Manipulator" (STEAM) in the current issue of the journal Nature Photonics. Terahertz radiation is in the electromagnetic spectrum between microwaves and the infrared. One of the central features of the novel device is the perfect timing with the electron beam. This is based on the fact that both generates an electron pack with the same laser pulse and the device is operated. "We start with an infrared laser pulse and divide it," explains the main author of the publication, Dongfang Zhang from the CFEL group of Franz Kärtner. "Both parts are guided by non-linear crystals that shift the laser wavelength: To generate the electron packet, the wavelength of the laser is shortened to ultraviolet and the laser is directed to a photocathode, from which it dissolves the electron packets. For STEAM, the wavelength is extended to the terahertz range. In this way, the scientists can control very closely at which state of the alternating terahertz field an electron packet arrives in the device. Depending on the exact time of arrival STEAM then performs its various functions. "An electron packet that triggers the negative part of the terahertz electric field is accelerated, for example," explains Zhang. "Other parts of the field lead to focusing or deliberate defocusing of the package or to compression by about a factor of ten." Compression means compressing the electron packet in the direction of flight, while in focusing shrinks the diameter of the package perpendicular to the direction of flight. In addition, STEAM allows an investigation of the structure of the electron packet along the direction of flight. For this, the package is fanned out laterally. When the fan-out packet hits a detector, a profile is created along the longitudinal axis of the packet. This method is called streaking and is regularly used for the analysis of electron packets in particle accelerators. In addition to its three other functions, STEAM can also fan out electron packets for streaking. "STEAM is a kind of Swiss army knife for electron beams," says Zhang. To perform different functions on the same electron package, several of the devices can be combined. The use of terahertz radiation is also responsible for the compact design of the experimental manipulator. "Terahertz radiation typically has a wavelength a hundred times smaller than the radio-frequency radiation used in large particle accelerators today. Therefore, all the structures in the device can shrink accordingly, "explains Kärtner, who is a senior scientist at DESY and a professor at the University of Hamburg. With a width of just over two centimeters, STEAM fits comfortably in a matchbox. "And that's just the case. The active structures are on the millimeter scale, "adds Zhang. STEAM technology is still at an experimental stage. 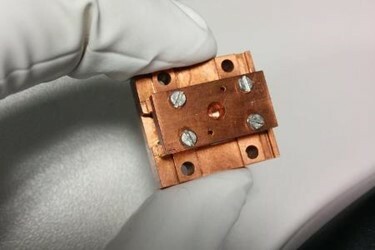 The developers see STEAM as an important first step on the road to a future generation of compact terahertz electron accelerators that can complement today's facilities and enable completely new applications. However, the mini-manipulator can already be used today. Accelerator researchers around the globe have already signaled their interest in using them to study their electron packets, as Kärtner emphasizes. "STEAM can be used for future table accelerators, but its various functions are also interesting for existing plants."